WASHINGTON, D.C. (February 4, 2019) – Now that Virginia Governor Ralph Northam has refused to resign over blackface incidents, some are suggesting impeachment, but that would appear to be contrary to the clear language of the State’s constitution, as well as to national precedent, suggests public interest law professor John Banzhaf, who published a similar legal analysis regarding impeaching President Trump. But several phrases in this standard make it clear that it applies only to actions or inactions during a governor's term of office, and in any event would not apply to whatever occurred while Ralph Northam was a student, says Banzhaf. For example, the constitutional standard for impeachment begins with the phrase "offending against the Commonwealth by . 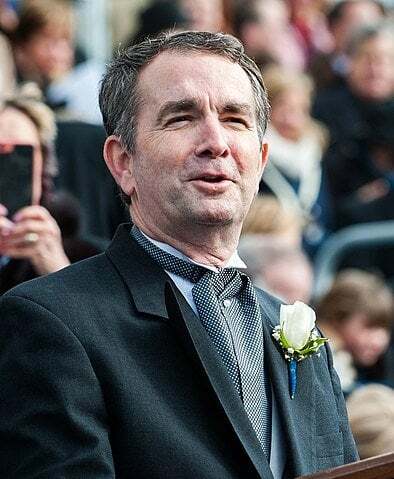 . ."
This implies that the acts of Ralph Northam in question must have occurred while the person was a governmental official, since it hard to see how a private citizen - much less a medical student and his yearbook - could offend against the state of Virginia. In other words, it appears that the phrase "offending against the Commonwealth by . . ." applies to all of the following terms, including "corruption," "high crimes . .," etc. Indeed, the very next phrase - "malfeasance in office" - supports that analysis, and also limits the standard for impeachment to acts done "in office." Moreover, in determining the meaning of words in a statute, courts rely upon a maxim of construction which says that, where there is a list of items, each and every one should usually be construed to be similar to the others, and not clearly different, unless such intent is made plain from the choice of words. So the words "in office" probably should apply to the other impeachment standards as well. This construction - that all of the standards for impeachment apply only to actions taken while in office - is strengthened and repeated in another standard: "neglect of duty." Regardless of how strongly one may feel about what Ralph Northam is alleged to have done, he was clearly under no legal "duty" to refrain from this activity, so it cannot constitute a neglect of a non-duty. Publishing a picture which is racist and offense to African Americans - especially only in a limited circulation yearbook - is not a crime, nor even a breach of any civil duty, any more than would be actually appearing in blackface itself. The final phrase in Virginia's constitutional standard - "high crime or misdemeanor" - also makes it clear that the standard is not meant to apply to what Ralph Northam did, regardless of when he did it. However harmful, hurtful, or even heinous one may think his action were, no one has suggested that they would constitute any "crime" and/or "misdemeanor." Indeed, as noted previously, any such actions would not even constitute a tort - a less serious wrongdoing - for which he might be sued and held liable in a civil action. The only phrase in Virginia's standard for impeachment which has yet to be considered is "corruption." That word seems to apply to actions taken while a person is holding some kind of office of trust - in the government or non-governmental entity - but not to what Governor Ralph Northam allegedly did as a student at a medical school. Moreover, since - according to the canon of construction noted above - it should be construed in a fashion similar to the other phrases in the impeachment standard, it would apply to "corruption" as in "corrupt politician," and not to "moral perversion; depravity, or perversion of integrity," which is a secondary definition noted in some dictionaries. It would also apply only to actions taken during his term as governor. Although the impeachment language in the Virginia and U.S. constitutions are not identical, they are similar, and both probably reflect in different words that the purpose of impeachment is to remove someone who has behaved improperly while in office, and not to punish someone for transgressions alleged to have occurred years (or even months - as in the case of Trump) before he assumed office. Although the issue is not crystal clear in the U.S. Constitution, there is strong precedent that a sitting president can be impeached - and removed from office by impeachment - only for wrongdoings committed while in office. The most persuasive precedent comes from the impeachment of VP Schuyler Colfax. Indeed, according to a study by the Congressional Research Service, Congress has identified three types of conduct that constitute grounds for impeachment, and all require that he already be in office. These categories, which may not be exhaustive, include: (1) improperly exceeding or abusing the powers of the office; (2) behavior incompatible with the function and purpose of the office; and (3) misusing the office for an improper purpose or for personal gain. In short, for impeachment, what is apparently necessary is some presidential (or gubernatorial) action that counts, in Alexander Hamilton's words, as "the abuse or violation of some public trust," and not even more serious crimes and other wrongdoing which may have occurred prior to the time he assumed office. However, although the wrongdoing technically occurred before Porteous took office, it was directly related to the office from which he was impeached Indeed, it could even be argued that the falsification which led to his confirmation rendered his appointment invalid from the very beginning, and therefore was directly related to his service in office. That is not true in any way regarding Northam. In short, while legislators may not be legally bound by what appears in the Constitution, and courts may be reluctant to permit a challenge to an impeachment which might be contrary to judicial readings of the constitutional standards, it does appear that the law regarding impeachment is on Northam's side, whatever that may mean in practice, says Banzhaf. An alternative process to remove a governor auch as Ralph Northam, similar to the 25th Amendment for the removal of the president, also exists. In Virginia pursuant to Sec. 16, Art V. the attorney general, the speaker of the House of Delegates and the president pro tempore of the Senate, or a majority of the total membership of the General Assembly, may proclaim that a governor is "unable to discharge the powers and duties of his office." The inability here could be based on the view that Ralph Northam can no longer effectively interact with the legislators nor with many other governmental officials. If that happens, the lieutenant governor becomes the acting governor. But the ousted governor can re-take his office unless the same designated group contradicts him. In that situation, he remains in office unless 3/4th of the General Assembly votes that he is unable to discharge the power and duties of his office. This avenue may be more effective than impeachment, suggests Banzhaf, since Ralph Northam may very well be judged unable to carry out his duties because of adverse publicity and public pressure, even if his wrongs do not fall within the standards for impeachment.